Poster sets also sold separately. Students deepen their understanding of the curriculum as they create poster masterpieces. Receive two FREE Poster Projects with this pack. Pack includes 9 Poster Projects: All About Me, Current Event, Historical Figure, An Event in History, Exploring Space, Health & Nutrition, Book Report, Science Experiment, and Examining a Story. Each student poster includes numerous highly-motivating activities. Poster Projects are great for team projects, independent activities, sponge activities, and learning centers. Students will be so proud of their posters, they'll want to frame them and hang them up! Each set includes 32 of the same, 11" x 17" poster pages. 288 posters in all. Regular price $63. CPP9 • $49 Save $14! 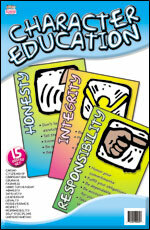 These three poster sets support and encourage using student teams in the classroom. Each poster set includes six colorful, extra-large 17" x 22" posters. The combo includes all 18 posters in these three sets. CPKT • $34 Save 8! 2. 4 Heads Are Better than 1! 5. Be a Great Teammate!